Enjoy the many wonderful benefits of safe, low temperature infrared heat therapy, used and appreciated by millions worldwide- the ultimate detox, revitalisation & recovery session. 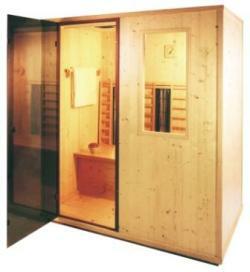 Our MagMed Physiotherm Infrared Sauna offers a radiant infrared heat that warms the body up to a depth of 4.5cm/1.5 inches, stimulating even deep tissues and organs. Hard to reach impurities are eliminated through your skin – the ultimate detox! Burns between 600-1000 calories per 30 minute session! Ultimate Detoxification, sweating is the natural way to eliminate toxins. Quick Muscle Recovery, decrease muscle pain & spasms. Relaxation with gentle therapeutic heat to improve sleep & feel refreshed. Pain Relief for tissue, joints & muscles. Lower blood pressure by improving circulation. Anti-Ageing & Skin Purification, stimulate collagen & improve complexion. Cell Health, stimulate the circulatory system, oxygenate cells & strengthen the immune system.